The 3440 X 1440 UltraWide QHD display offers amazingly sharp picture quality. Its pixel area is about 1.8 times larger than an UltraWide Full HD 21:9 monitor, and about 2.4 times larger than a Full HD 16:9 monitor.With IPS, color reproduction is improved and users can view the screen at virtually any angle. 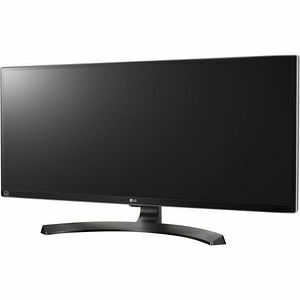 With over 99% coverage of the sRGB spectrum this LG monitor is a great solution for professional photographers, graphic designers or anyone looking for highly accurate color. Save time when you power up the battery of a connected device using USB 3.0 Quick Charge. Once enabled, this convenient feature allows a phone or other mobile device to charge up to four times faster than regular USB 3.0. LG's 21:9 UltraWide monitors with FreeSync technology eliminate the tearing and stuttering that have plagued gaming enthusiasts for years.